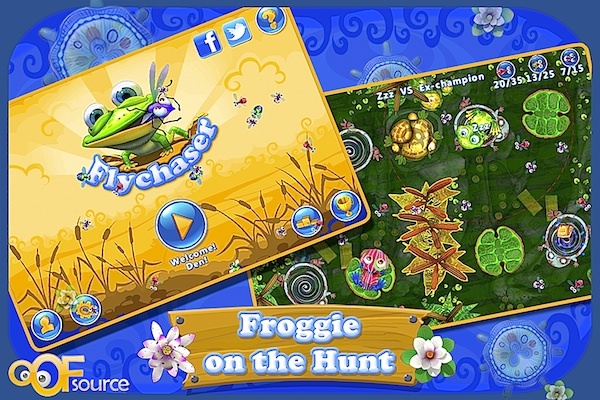 Flychaser is a game for iPhone, iPod Touch, and iPad where you play as a frog who must catch flies (surprise!). 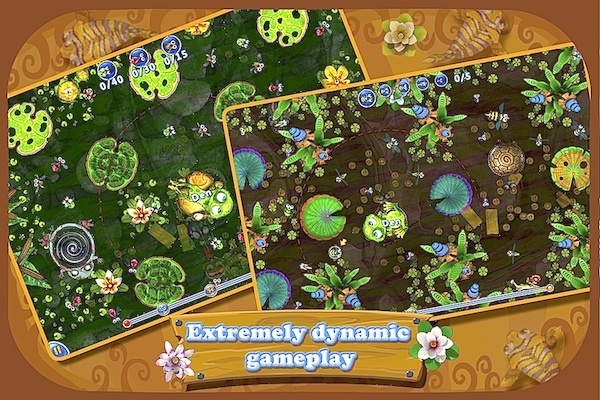 The main game is broken up into many different levels, each with its own goal, which mostly involves jumping between lily pads and rocks and catching bugs. Doesn’t seem too involved, but many games manage to pull you in despite only being based on a simple premise. Certainly the iOS App Store are perfectly suited for quick and simple games, so the concept fits the platform well and it provides some solid quick bursts of entertainment on your iPhone. All you have to do is move your frog around to catch bugs and build combos. There are traps to avoid, and bonuses to collect. Controls are usually a sticking point for iPhone games. Many games have a great idea, only to be held back by touch screen controls. Usually this limits games to a single pointer control scheme. Sometimes they can flourish with this scheme, and other cannot. Flychaser works well within these limitations, given you control a single frog and direct his movements with a single stab of your finger. For this review on my iPhone 4S, I had no problem picking up the freshly downloaded app, and catching some tasty bugs. The control scheme works perfectly well. The graphics in Flychaser are another positive area. They are bright and sharp, and fit the concept perfectly. It is very easy to distinguish between the different elements, so even on a smaller screen, there is never any confusion about where to go or what to do. Everything from the frogs to the menus has had a nice coat of polish, which really can make the difference between one game and the next. The audio here isn’t a standout, though it performs well enough. Imagine any interactive entertainment geared towards the younger set, and its’ cheery, warm music. You could swap their music and Flychasers back and forth and never really notice the difference. It’s not bad, it’s just not anything special. Could you even expect award winning music out of a small application like this? So is the application worth the $0.99 price tag? While Flychaser may be in a budding stage, it does have over 100 levels. They don’t take hours to complete of course, but each should last you a couple minutes. Then there are multiplayer modes, extra goals, a bonus shop full of extras to unlock, and other modes. Developer OOFSOURCE has made sure that if you like the app at all, you will definitely get your 99 cents worth. AppSafari review of Flychaser was written by Joe Seifi on March 27th, 2012 and categorized under App Store, Arcade, Games, iPad apps, Universal. Page viewed 3377 times, 1 so far today. Need help on using these apps? Please read the Help Page.